It’s science week at school and G1 has entered the bake-off competition. 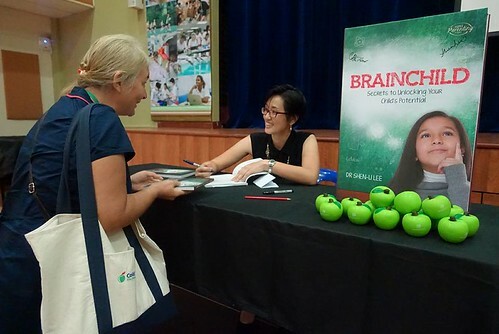 After snagging a prize for his Book Week costume (only 20 people entered because participation in secondary is apparently quite low), he was inspired to try again for Science Week. Baking is not really his forte, but if participation for Science Week is as strong as Book Week, I think his odds are good. G1 has done various baking and cooking activities in the past, but he has never taken on a project of this magnitude before. I don’t think he realised quite how involved it would be. He only admitted to me afterwards that it was harder than he expected it to be. Since it was a competition he was entering, I left him to the handiwork while I provided the guidance – being marginally more experienced than he is where cake baking and decorating is concerned. 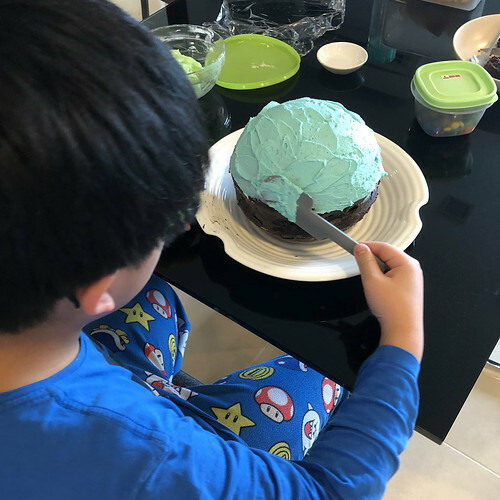 After scouring the internet for ideas, he settled on this design by Tablespoon because he liked the idea of having rock candy in the core of the cake. We had to make a few adjustments because we didn’t have all the necessary ingredients on hand. We didn’t have sports ball cake pans, so we used two 8 inch Blanda Blank stainless steel IKEA bowls and they worked out pretty well. The recipe calls for two boxes of cake mix. G1 wanted chocolate because it’s the science teachers’ favourite flavour. We used a box Green’s Temptation Chocolate Cake Mix and Betty Crocker’s Super Moist Chocolate Cake Mix each. For the record, we think Green’s tastes better. We couldn’t find rock candy either, so we substituted them with M&Ms and Maltesers (again G1 picked those, probably because he likes them best). The other options are Milo Nuggets or Kit Kat Balls. I think they would work pretty well, too. I couldn’t find ready made icing so we made our own using icing sugar, butter and milk. Mix together 440g sugar, 160g butter, and 40ml milk – that was the quantity G1 used to ice the cake and pipe the continents. We dyed 2/3 of the icing blue and the rest green. We were a little short on the blue icing and ended up with an excess of green so you could probably do 3/4 blue and 1/4 green to make things a little easier. We made chocolate butter cream icing to fill in the gaps in the cake. The icing came with the Green’s cake mix so we just followed their instructions for the preparation. We also made changes to how the cake was assembled – see below. 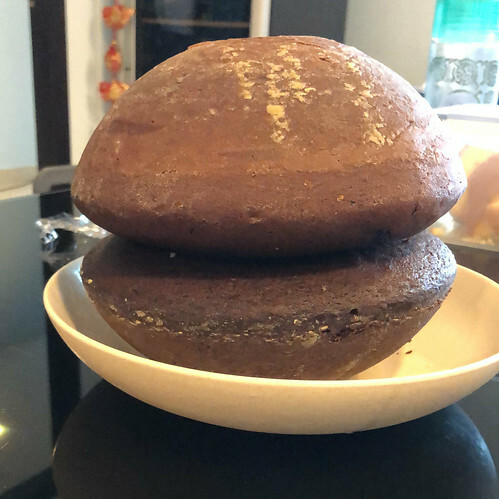 We used two boxes of cake mix – one in each IKEA bowl – but the cake halves weren’t quite tall enough to make a truly spherical cake. It’s also possible that the cakes started to sag under its own weight. If we were to make it again, I would recommend three boxes of cake mix divided evenly between the two bowls. Grease your cake pans (IKEA bowls), then dust them with flour. Prepare the cake mix, following the instructions on the box. Bake the cakes in an oven pre-heated to 180C. The cake mix instructions state that it should be ready in about 50 to 55 minutes. Ours took longer to bake – about an hour and a half. Remove from the oven and let it cool for about 10 minutes before removing the cakes from the bowls. Chill them in the fridge overnight (or you can put them in the freezer for about an hour – we didn’t have enough space). I forgot to take pictures of the Malteser/M&Ms core assembly but it was pretty similar to how they did it over at Tablespoon, except we didn’t remove the curved rise of the cake. We dug out a hole in the center of both cakes using a round soy sauce plate as a guide. Then we filled the holes with Maltesers and M&Ms. To prevent the chocolate from falling out when we flipped one of the cakes over the other, we cut a round piece of cake from the scraps and used it to cover the chocolate. 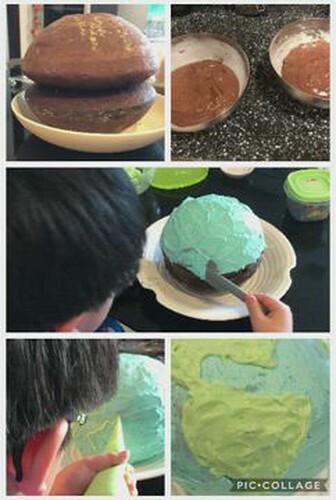 Fill in the gap between the cakes with the chocolate icing so it looks more like a ball. Next, spread the blue icing over the rest of the cake. 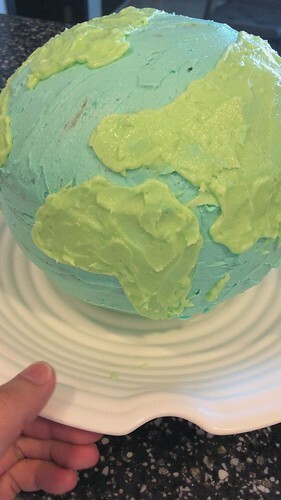 Using a map or a globe as a guide, pipe the outline of the continents on with the green icing. Roughly, “colour” them in with the green icing. Smooth out the icing with a knife. 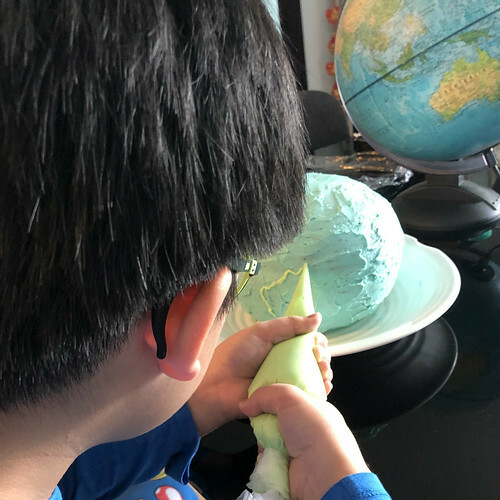 G1 was fretting that the continents didn’t look quite right (making a cake in your head is always easier than the reality) but I assured him that as long as the shape was roughly there, it would be fine. He could be accurate by making sure he added the larger islands, like New Zealand, Madagascar, Papua New Guinea, Japan and Hawaii. I must confess that it turned out better than I expected it to.